I like to write on Quora, a website for contacting professionals to ask them questions. Sometimes I ask. This time I answered. William Vietinghoff asked: Would you rather have a home that is functional, but cluttered and messy, or a home that is furnished sparingly like a showplace, but inconvenient for day-to-day living? It was an excellent question and one often asked by my clients. The difficult part of the question is whether cluttered and messy is functional. To some it is and to others, no. So first we find out, especially if there is more than one person living with you. We take an inventory. If you are living alone, then what are you looking for, a bit of both? I doubt one would choose inconvenience, so the first part of your question might be considered bias towards the last part. Here’s a few questions for you: Do you know the constraints of what is your messy? Are there containers for your type of ‘mess’? Do you appreciate clean sparing modern design? How do you see the two worlds living together? If you can’t answer these questions, you probably need a good designer! I’ve solved this kind of situation time and time again. It’s called designing for the ‘normal client’! Carolyn, you are right. There are always better places to put things to avoid the “cluttered” look without wrecking the functionality. Have you ever left the sheets draping on the floor from your bed? The blankets thrown on top? Do you ever rinse the dishes and leave them stacked in a tower next to the sink with a fresh flower in the top bowl, observing the pottery mix of designs….for awhile….maybe longer than you would normally? How do we organize and how are we ok with the mess? Both show who we are. Being in and out of people’s homes, I am fascinated with the tendencies people have. The patterns of their behavior they have with their things. Do they always live a certain way or give themselves liberty to be the opposite? Who are we if we don’t have an opposite view? Are we polarized by our habits, with our new ideas rating acceptability, by our standards? I’ve been thinking about the art of interior design. When do clients embrace it and when don’t they. When does decorating become art? 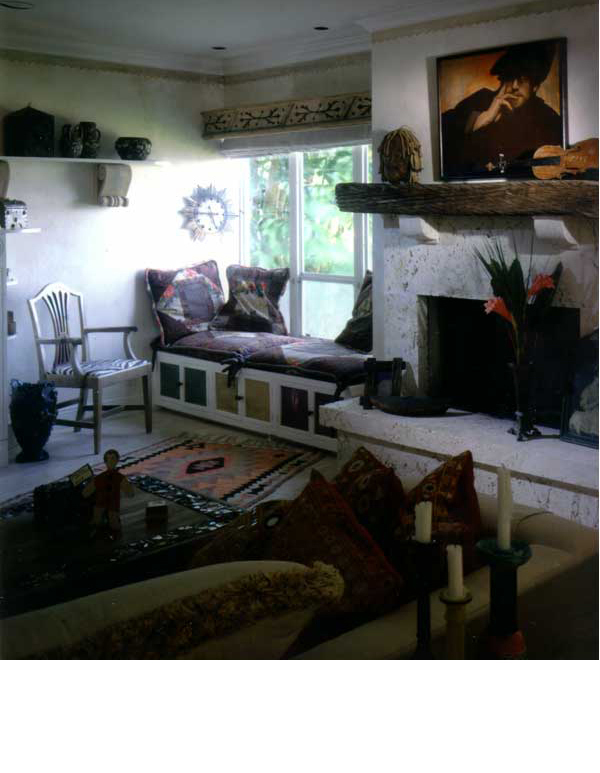 Years ago, I commissioned my friend Carlos Alfonzo, to complete a large scale painting for a client’s house. The clients asked that I give Carlos a color palette of colors we had used in the interior. He cringed and so did I, of the request. We both felt art should not have to color coordinate with furnishings. Later he presented his painting with no colors from the room. He was a free artist and his work was his liberation. When the clients saw the painting, they asked me to go back and request he add certain colors. He refused, as I suspected, and he kept the painting, not receiving his payment. I felt sad, yet as an artist myself, I understood. Needless to say the clients lost not only a great investment but the insight that color doesn’t matter. Just like beds can be left unmade. Sometimes woolen patches make the sweater. Leaves fallen on freshly raked ground, tell a story in their haphazard arrangement. Things are by nature unpredictable. Yes, we need the well made plan. We will always have our habits. But it is the broken habits that often tell another story. It is the art inside of the design that is the creme of the crop, the tell tale sign of the artist in all of us. The helter-skelter of our true nature, reveals the daringness of who we really are. I've been kind of a snoop these last two weeks. I’m in the process of surveying my friends for do's and don't's on classes I’m building, most likely offered on-line. I've gotten over feeling intrusive. At first it felt so odd to ask people about their design habits or desires or frustrations. I’ve never minded asking people how they live, especially if I am designing for them, yet asking about design habits is different. It seemed more personal….which I suppose it is. How can I design a class without knowing what people want to learn? So I ask. From the answers, I've determined there is generally a lack of interest in finding the balance between the function and the esthetic nature of a space. It's the sort of thing I think about every day. In the branch I bring in from outside, or the color of a square on the wall. Hmmmm, maybe because I'm a designer and a kid at play? Yep. Duhhh.. Yet I believe everyone is a designer. I contemplate the inclusiveness and the difference between taking an account of how we work or live and making artistic choices in changing a space. Steven Covey in his book: Seven Habits of Highly Effective People, taught me: "Seek to understand before being understood". Those simple words changed my career at a crucial time and helped me remember to listen first. Really listen. How does my client feel? What drives him or her or brings happiness to their lives? When I have these questions answered, then I can design. Before, I might as well be threading a needle in the wind. Only through the eyes of my client, can I view the world I am entering, if I am to design for them. I become an actor of their life and sometimes I am two or more actors if there is a family living in a space. Or I become the public impressions of a business. The constraints of the space, the existing furnishings, the way entertainment time is spent or meals are eaten or if there's a need for a work station among children playing with toys. This is all evidence. From this investigation, bones are built. The first steps are the functional bones. After the bones, then artistic decisions are garnished from 'who is the client? ', if I've been privileged enough to find out. What inherent and driven styles emerge? Is the client aware or not of their style? My mission then, is to learn how the functions of the place play a part and then, who are the people? What is their natural style? From years of experience, ever person has a style. Very unique. Very their own. How might I teach this balance of function and esthetic, is my first hurdle. I ponder two questions for a person wanting to design on their own, or work with a designer. Have you listed all the functions of the space you are living in, or working in? Do you know your own style and use that knowledge, when you consider the task at hand? It seems natural to me that before looking at what the market suggests, explore history and the present the life you are living. Look for the signs of what makes up your very unique individual life. I am always changing my style, adding things for a while and then moving them out. Yet certain pieces usually stay with me. I have a little gypsy-hippie from my Mill Valley days so I like slouchy and informal. Pillows and low light. I also a have a bit of South Pacific Mid-Century Modern Miami, from living in South Florida for twenty years. There are usually orchids growing in my bathroom and old bark cloth remnant in my furnishings. I like woods more than metals so I suppose a bit of wood elf is in me too. Rich color and grain I prefer. I set one of my bonsai trees on a pedestal and imagine I'll create more of a Zen like space someday although I have some already with a wooden Buddha and blank walls. I am past, present and future...and the future shows itself in what temps me from the outside world right now. What is new that appeals to me? How could it be part of my present? I believe if you find your style, you are ready to begin an interior.